Now having reached supposedly his 100th film, Takashi Miike is still a director seemingly incapable of producing a straightforward genre piece. On the face of it, this supernatural Samurai slasher – evidently based on a manga series – could easily have only dealt in crowd-pleasing schlock and splatter (and it definitely does do that). But it is also a meditation on the nature of revenge; a study of a young girl’s lost innocence; and an existential look at human fallibility, redemption and death. For a film which features an immortal Samurai who is brought back to life by ‘bloodworms’ that stitch his limbs back together, this is still somehow one of Miike’s more accessible films, starring a real Japanese heartthrob, Takuya Kimura, who is superb in an against-type role as the undying fighter Manji. 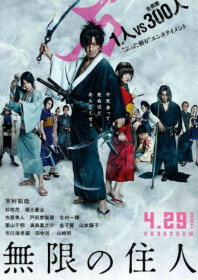 But the real driving force of the story is Rin (Hana Sugisaki), a young girl who witnesses the death of her parents at the hands of the ruthless Ittō-ryū clan, led by the ice-cold ronin Anotsu (Sôta Fukushi) – a typically cadaverous Miike creation. She promptly follows a witch’s guidance to locate Manji to help her with her quest for revenge. Her interactions with the adult world are not always innocent: she is pitied by some, and considered a nuisance and a muse to others. But Manji sees flashes of his own dead sister in Rin, who was killed 50 years ago at the hands of bounty hunters. As a result, their relationship becomes less paternal and more like squabbling siblings, with Rin told to call him “big brother”. Their bond strengthens as they battle against an increasingly bizarre set of characters. This is when it becomes clear that Manji is actually an inferior swordsman, and is only saved from death by his inability to die. The film then culminates in a large-scale battle which is almost as relentless as the final act in 13 Assassins. This may lack the poignancy of that masterpiece, but it is still an incredibly well-measured, entertaining and courageous comic book adaption that simply has to be watched. Studio: Recorded Picture Company, Warner Bros.